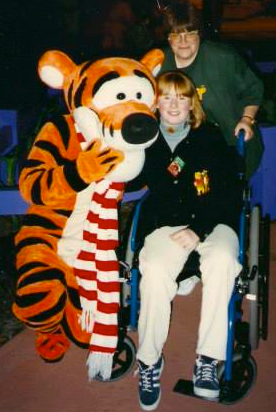 When I was diagnosed a neighbour who was involved in the charity Dreams Come True, who grants the wishes of chronically disabled kids, nominated me for a dream trip to WDW. 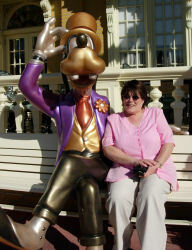 Incidentally this neighbour has no idea what she started and the happiness it has brought me throughout my life! 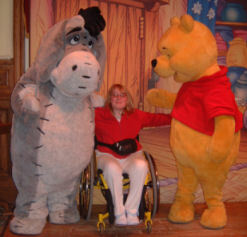 I could still walk some distance although I would use a wheelchair as I was so unsteady. In fact this was the only time I was able to walk more than a few steps. 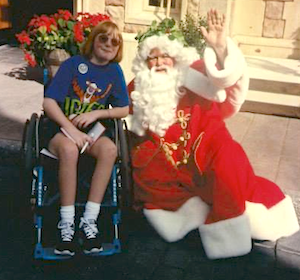 Now - over 25 years later - it really is strange to imagine that I could walk once - I guess “wheelchair user” has been who I am for so long. I think it’s actually one of the easiest parts of FA to live with and it definitely hasn’t stopped me enjoying WDW over the years. This trip was originally planned for the October (a month before) but in late September I got called in to have Harrington Rods in my spine to fix my Scoliosis and I wouldn’t have been well enough to go in October so mum changed the booking for a month later. This was just six weeks after major surgery on my spine – I am now quite impressed at how quickly I was well enough to travel – I remember working hard at getting back to being able to stand to transfer and at walking a few steps. Even so it must have been so difficult – I must have still been in a lot of pain. I guess with WDW as an incentive I just got on with it! I was fully recovered from my Scoliosis surgery by now although I never got back to walking and was still only able to stand to transfer and take a few steps. 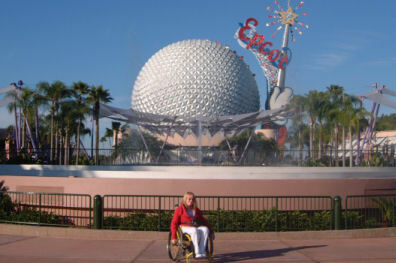 Thanks to WDW being so wheelchair friendly not being able to walk has never been a problem – especially now that every bus, boat and monorail is accessible. Aside from that, I just adapted, which is easier to do when you’re young I guess. This was our first Christmas in WDW – it’s a really special time to be here and Disney make a huge effort in making WDW festive! We stayed at Disney's All Star Music Resort this year and I still remember how the decorations took my breath away when the coach dropped us off - they were stunning! Virgin Holidays came to our rescue this year when mum “lost” all of the park tickets and transport vouchers we’d bought a few days after we arrived – Virgin Holidays replaced them all. She found them a few days later but that’s not the point!! I can only think that the three/four year breakbetween this and last holiday was because of me taking my GCSEs at school. I was now studying Information Technology at college. On all my previous holidays I had basic NHS wheelchairs and had several broken parts after baggage handlers had thrown them on and off aircraft. This is one of the reasons why I had bought my first lightweight and rigid wheelchair – a Kuschall Competition 10 – a couple of years earlier. Being rigid the chair had no parts to break, as it was so light I could move around in it and it was a lot easier for mum to push around. If you’re paying attention you’ll have noted that this was our third stay at the Disney’s All Star resorts and this time we chose Disney's All Star Movies Resort. 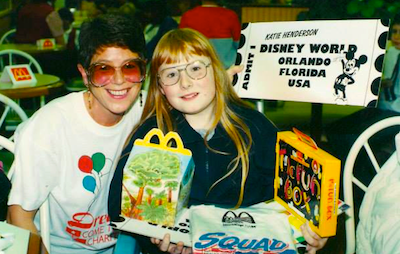 We have very fond memories from our stays here – because of its themes and vibrant colours it was VERY Disney. We also really loved the big food court with its many different foods on offer. However the resort was a bit of a victim of its own success and as Disney’s “budget” range of resorts it became overrun with noisy cheerleaders and families who would pack out Disney's Complimentary Resort Transportation leaving us waiting for ages cold and tired after a day in the park. I worked at ASDA as a CCTV at this time. Apart from the odd awesome adrenaline rush of catching a shoplifter, I spent the majority of my working day bored, unfulfilled and unhappy – I would have been very excited about holiday time this year!! 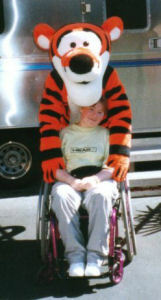 I had bought a new rigid and lightweight manual wheelchair – an RGK Hilite – in the summer before. Compared to all of the chairs I had owned this was my very favourite as it was so light, comfortable and it looked so great. I remember there being a big lake in the middle of our hotel and I challenged myself to push myself all the way around it – I guess about a mile and a half in total. I now envy the “me” who had the strength, stamina and balance to do this so much! This was the last year I wrote postcards. I still wrote quite well but it would just take so ridiculously long that I finally admitted defeat and spent the time enjoying my holiday instead of clinging on (this is something that has rung true in many different ways throughout my life – stop clinging on and start enjoying). This year I started a new job at the West Midlands Police which I found with the help of the Shaw Trust (a job-broker for disabled people). Even though my role was within administration and fairly unexciting I worked with some great people and I really enjoyed my few years here. As we were so disappointed by Disney's Coronado Springs Resort, we decided to give the WDW Dolphin a try. This resort is in WDW – it’s so close to the magic that we actually walked to Epcot and Disney's Hollywood Studios and we watched the fireworks from each of these parks from our hotel room window. However it isn’t actually owned by Disney so the resort wasn’t themed and there wasn’t a Mickey Mouse around every corner! 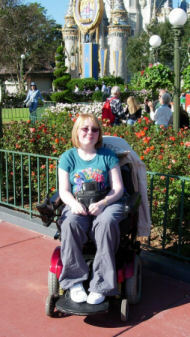 At home I had started to use my powerchair more and more – I loved the independence it gave me, so this year we decided to take this powerchair – a Jazzy 1121 – along with us. After getting it there in one piece and enjoying the first few days of our holiday in it, it didn’t appear to want to charge. The hotel’s concierge put us in touch with a local mobility equipment dealer who advised us that we needed new batteries, which we bought and they fitted. However the batteries still didn’t charge! So in desperation we phoned Virgin Holidays who told us what we needed was a converter to convert the weak US power into power that was enough to charge our English chair. Through them we hired a converter – problem solved! A few days later my grand dad had a stroke and as things didn’t look good for him our family contacted us to let us know. We decided to fly home as soon as we could and again we relied on the support of Virgin Holidays to get us home ASAP. Sadly grand dad died two weeks later. We were so impressed by the hotel last year but given what happened we didn’t want to go back there. Fortunately this hotel was part of the WDW Swan and Dolphin Resort – the Dolphin was the hotel we stayed in last year and the Swan is another hotel but very similar and in the same location which is where we stayed this year. As we spent a lot of time looking out of our hotel room window last year and mum didn’t want a constant reminder of what happened, she wrote a letter to the WDW Swan explaining what had happened and asking for another view. She didn’t receive a reply but when we checked in we were not only given a room with a different view but the adjoining room too – so mum and I had a room each. I will NEVER forget this – such a lovely thing to do. The hotel was magic. The grounds were beautiful and as it is built around waters which went around WDW, which meant that Epcot and Disney's Hollywood Studios were accessible b y boat from a dock at the entrance of the hotel. But as both of these parks were about 20 minutes away by foot we mostly just made our own way there. Also right outside the hotel was Disney’s Boardwalk and we spent many evenings here – a big lake which is spectacularly lit at night and surrounded by all three parks so from here we could see all the fireworks shows whilst dipping into the shops, enjoying the entertainment/atmosphere or eating. It was a really brilliant place to be! 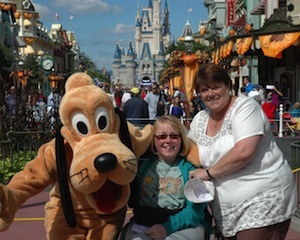 After all the hassle we’d had taking my own powerchair last year, we decided to take my manual wheelchair (I still had my RGK Hi Lite) and hire a powerchair in WDW. We hired one – a Jazzy Jet 3, which I was very impressed with – from a company called Scootaround. This year we flew First Class, which was amazing! Until about 1997 I could still walk up the aisle of an aeroplane but it was never a problem when I was no longer able to. Two mobility assistance people would lift me into an aisle chair (as the aisle isn’t wide enough to accommodate a normal wheelchair), they’d wheel me to my seat and lift me into my plane seat. We went back to the WDW Swan as we had such a lovely stay last time. 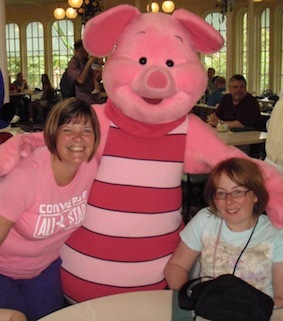 If I was ever to go to WDW again I’d be very dubious about staying anywhere else – I’d found my perfect place. This holiday was pretty perfect in every way – all of our WDW experience led us to spending the holiday doing the things we knew we’d enjoy and we knew exactly how to make them happen. 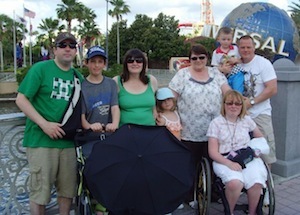 This was our last stay in WDW itself, and if it’s our last one ever then we certainly finished with a bang! Two years earlier, after seven years of work, I took medical retirement – every aspect of work just became too physically demanding. So for the first time in years when I came back from WDW and didn’t have work to go back to, which meant I hadlots of time to recover. This holiday was a completely different one for mum and I as it was a) off-site, b) in a villa not a hotel, and c) we were joined by two of my brothers, my sister and their families. It wasalso the first time we hadn’t flown with Virgin Holidays – we flew with British Airways but their mobility assistance was equally good. For me the holiday was a bit of a failure. Mum and I were aware before we went that the villa where we were staying had no adaptations for people with disabilities but without really thinking about it we said “we’ll ma nage”. I guess because we’ve always booked accessible rooms we’ve never really thought about what life would be like without rails, a bathroom you can move around and reach everything, low thresholds and a hard floor/low pile carpet on which you can push yourself etc. I found out it was a bit of a nightmare actually, and I needed help to do everything. 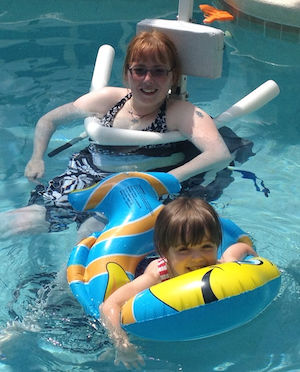 I feel much more disabled/less able on holiday than at home anyway, but especially so on this holiday. We didn’t hire a wheelchair accessible vehicle which meant my brothers had to lift me up and into the car every time we wanted to go out. This was a faff and a hassle and in the end it was just easier to stay in the villa, which would have been okay if the pool had a hoist so I could get in and out of it – but it didn’t! 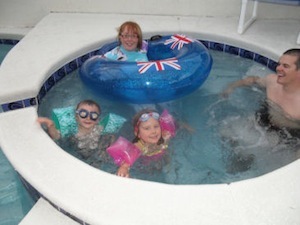 Although my brothers lifted me into the jacuzi once (see picture above right). Despite that it was so special to see my nephew (5) and niece (6) enjoy it all and experience the place mum and I have loved for all these years. My sister wasn’t pregnant when we booked this holiday the year before but six weeks before we flew out she had a little girl, so my six-week-old niece came too which was an interesting experience!! You may have noted that in all previous years we’ve been in the autumn/winter. I find the heat really wears me out we’ve always avoided the summer months. It’s busier too as the kids are off school which is exactly why we went in the summer this time. 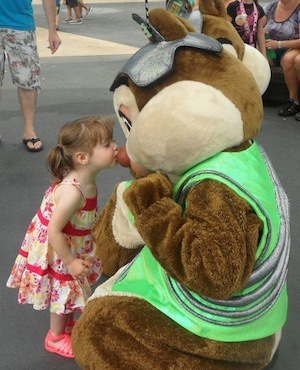 So it was hot and busy – not for me!! On the day before we left for this holiday I signed for my own flat. After being on the housing waiting list for 5 years I had written to my local MP six months before and he got things oving for me. Read more about this on the independent living page. After experiencing such extreme wheelchair-unfriendliness, I was keen to get back and create a space where I could be me and my disability didn’t hold me back. This holiday we found a villa that catered for my needs completely. I had been living in my own flat for two years now where I had agency carers and used a hoist for all transfers. I could still stand to transfer but I was becoming quite unsteady, less confident and needing to put a lot of weight on mum which put her at risk when I did so I knew what I needed was a hoist on holiday too, which the Grange Villa Florida had and it also had lots of space to use it. The villa also had a pool hoist, which is actually one of the things I loved most about this holiday. 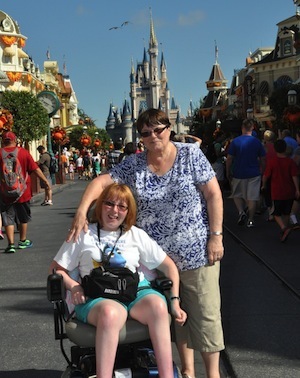 We hired another powerchair from Scootaround, and a wheelchair accessible vehicle from Wheelchair Vans of America so it could be clamped down insi de. Having this vehicle allowed us to see bits of Orlando that I hadn’t been to before. Mum and I were joined by my sister, her husband and my now two-year-old niece. As mum’s getting older and I have greater care needs now we really appreciated Zoe and Conrad’s help – I’d go as far as to say I don’t know if we’d have been able to do it without them. I also have a very special niece and it was an absolute pleasure to share my favourite place in the world with her. The toilets on planes aren’t accessible but I’ve always “held it” for eight hours without much difficulty, however I’m not so young anymore and on the way back, about two hours before we landed, I was quite stressed – I needed to go and a very uncomfortable two hours followed. It’s about time aircraft caught up with the DDA and the 21st century!! This holiday we flew with Virgin Atlantic and I was very impressed with them - their staff were friendly and knowledgible. I have a curvature of the spine (Scoliosis) and I tend to lean and sit uncomfortably when sitting in unsupported seating. We arranged to have some support seating (Burnnett Body Support) fitted to the plane seat before boarding and this really helped me to maintain an upright position. The seating is filled with air so it moulded to my body shape and I asked for the air to be refilled during the flight whenever I felt pressure. We again highered a wheelchair accessible vehicle from Wheelchair Vans of America which we picked up from the airport. In this vehicle I could clamp my wheelchair down without transferring out of it - the van makes life so much easier. 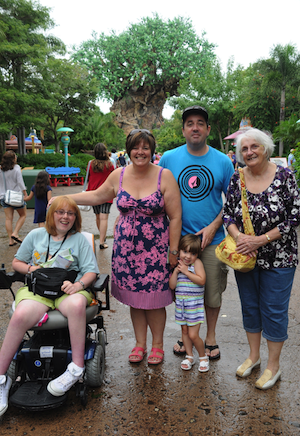 It was bigger than the one we hired last year as I was joined by my mum, niece, sister, her husband and his mum. 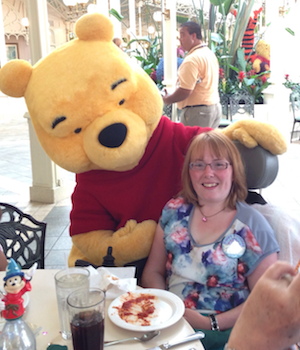 I took my own manual as I worry about bagage handlers damaging my powerchair, but wanting independence I hired another powerchair from Scootaround. We went back to Grange Villa Florida although this time we stayed in Charm Villa. This villa had a mobile and pool hoist, adjustable bed and lots of space for mobility quiptment just like Katie's Villa that we stayed in last year, but it's a bit smaller with one less bedroom and is in our opinion slightly less homely. I got a new lined (and so less flimsy) hoist sling from my OT earlier this year an it made hoisting so much easier. 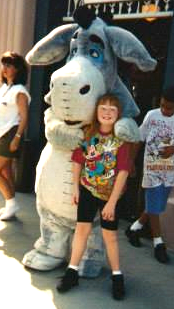 This year marked not only 20 years since our first visit but it was my 30th birthday whilst we were there too. What a way to spend it! I had such a lovely day. My sister made us all a birthday breakfast - my favourite - waffles, maple syrup and strawberries - for breakfast, my niece helped me to open my cards and then we went off to dinner at the Magic Kingdom with Winnie the Pooh! My sister's husband got me a badge saying "Happy Birthday Katie" so everyone wished me happy birthday as we wondered around the park! Looking back it’s lovely to have such great memories of our holidays over the years. I am sad how things have changed – how our holidays have become more complicated and more about struggling than just getting out there and enjoying ourselves. But I feel triumphant that we’ve always managed in spite of that struggle.